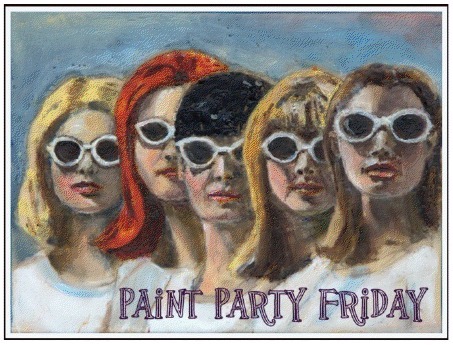 Welcome to Week 51, Year 2 of Paint Party Friday! This week's featured artist grew up in a gallery (literally! ), and it is very apparent when you view her amazing paintings that she is definitely at home in the studio. Please welcome Marjorie (Marji) Thompson! I started painting as a kid. My Dad was an Artist; a painter. Our beach home was his studio and art gallery which was open to the public on weekends and in the summer. I grew up immersed in art and working in and creating for the gallery. I learned everything I know about art from my Dad. I have no formal training in terms of art schooling. The mentoring that he provided to me growing up is what fuels me now as I go forward with my art. When I went off to college, art came to a screeching halt for me. No art in my life for about 17 years while I got on with life. I jumped back into art again by working with metal and creating fabricated silver jewelry. The jewelry business treated me well, but I never felt that it was the “be all end all” for me. I left that behind after 7 years and dabbled in being a small business owner. In order to concentrate on this new business, I closed the door on my studio and once again shut art out of my life. It took me 5 more years to finally understand that a creative outlet in art is what makes me my best me – that it is not possible for me to live a happy and full life without it. Three years ago, my Dad passed away. I felt lost without him as my anchor and grounding to art. Rather than striking up the jewelry business again, I decided to get back into painting and keep some connection to my Dad and all that he taught me. I grew up painting with oils and acrylics and I inherited all of his old paints and brushes. Yet, this type of painting didn’t feel quite right to me even though it was what I knew. Purely by chance, I wandered in on an encaustic painting demo during an open studio tour. I knew immediately that painting with hot wax was the direction for me. I sought out lessons and workshops and set up my encaustic studio January of 2011. Hot wax (encaustic) is one of the most amazing mediums out there. Of course I am a little biased. It can be sculpted, textured, and layered. You can embed paper, transfer photos, ink, pastels... it is really as vast as the imagination of the person creating with it. I make my own medium (beeswax + damar resin) in my garage. I use R&F encaustic paints as well as tint my own with oil paint and with dry pigments. My palettes are two pancake griddles that I purchased at Target. My favorite tools are pottery making tools with various sizes of scrapers, cookie cutters, and book binding awls. I also use my Dad’s old oil painting brushes. I’m still in discovery mode in my art. I feel like an adventurer every time I enter my studio. Seems that animals and birds are what I am enjoying painting right now. 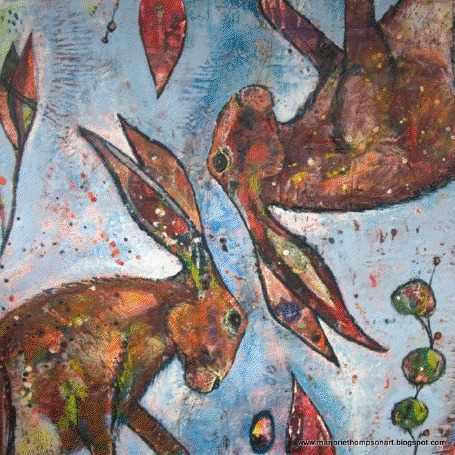 It takes me back to my roots when I was a kid and animals were the subjects of all my paintings. I am also enjoying painting portraits – the human face is so interesting. I feel that abstract art is so very difficult for me. It seems to be the subject most encaustic artists paint, but for me – a portrait is easier. My greatest painting moment to date happened this past summer. I pushed myself to get my art out on view to the world, which was a big step at the time. I entered two juried local shows. It was a hugely proud moment for me to see my art hanging on the walls in these two shows. I hadn’t seen my paintings on public display since I was a kid. It felt like I had met a major milestone on the artful journey. I just want to carry on with the wax. I love its quirky nature and I feel that I am finally getting the hang of it. I’ve learned to work with it versus try to control it. I keep experimenting and trying new things. I’m also finding that I am really enjoying using oil paints and it’s a nice contrast to the wax. It offers the control and detail that is so very difficult with wax and thus it feeds my need to paint a little finer. I love painting portraits and want to move into figurative painting as well as painting larger. Birds and animals will always be my subjects, but I’m looking to find more creative ways to paint them. I have two local events that I am getting ready for. One is the entire month of April my art will hang in a public space and be part of a local art walk event. The other is the spring wine release at a local winery in May. I want to keep getting my art out into the world. I just launched my online gallery and also a Facebook artist’s page. Little steps towards something big. Thank you for such a beautifully inspiring interview, Marji! And, congratulations on launching your online gallery and facebook page - We're sure this is just the beginning of "something big"! Hey PPFers... The PPF Auction Blog Hop to benefit Sandy Hook Elementary School is just a couple weeks away! There is still time to paint and plan your auction post... If you are planning on participating, please be sure to send us a photo or scan of your painting (and your blog link) by next Friday (March 8th). As always, please make sure to use your post URL address NOT your blog home page URL address as there are many late visitors who get confused as to which post is for PPF when they arrive (after Friday) at your website. If you are unfamiliar with Mr. Linky, an explanation of how this tool works can be found on Week 1 and Week 2 Check-Ins. Have a fun and creative week! oh I love love love Marjorie Thompson's amazing work!!! wow!!! thank you for hosting this week!!! happy to be here!!!!! Enjoyed this interview. Congrats Marjorie on your getting your art out there. Love your work. wonderful art by Marjorie - love it! Really great interview and wonderful work by Marji! 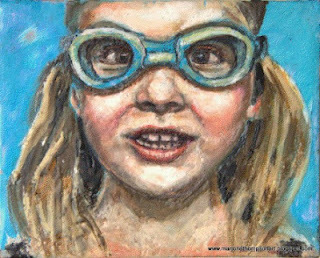 I love the rabbits and the young girl with the goggles! I know you are going to be winning medals very soon! Marjorie, I love the ladies with the sunglasses. You do such great work! I love Marjorie's style. Blessing! Thanks for introducing us to Marjorie's wonderful Art and imagination. another wonderful interview-Marjorie's art is gorgeous!! I especially love the rabbits :) Happy PPF all! I am so thankful to open this kind of site of yours because you really helped me so much to know how and what to do when there are things that will happen like this..because honestly i really don’t know what to do in terms of same topic . LOVE the animals - especially the birds and the environments that you put them in Marji ! Thanks for providing the interview. AMAZING! work and beautiful tribute to her dad! What an inspiring interview. I love how Marjorie is so inspired by her dad and used that inspiration to find her own voice. Her paintings are just beautiful. Thank you for sharing her interview and work! Marjorie's work is amazingly beautiful. I loved hearing about her journey. Thank you. 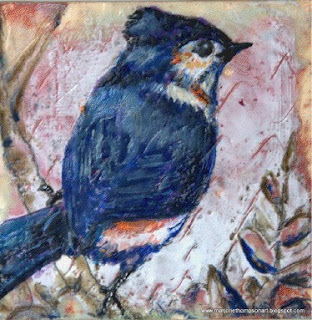 I love Marji's work and am so pleased she stepped up to be the featured artist on PPF! It was lovely to read about her life and what started her journey to art - how wonderful to have grown up in a gallery!! Thank you to Eva and Kristin for hosting my story this week. And, thank you to everyone who has left a comment here. Its hard to put into words how amazing I find this space. The love, encouragement, inspiration and heart felt friendship that I have been part of over the past year is incredible. The tribe that has come together in this place is magical. I know personally it has made a big difference for me to connect to other artists each week and to share our love of creating from our hearts. Thank you, thank you. I'm looking forward to next year and all its wonderful inspiration that comes from the participants of PPF. What a wonderful interview. I love your work Marji. SO rich, so much texture and beautiful. I especially love the faces you've done. I cant' wait to see what you do next! Wonder work and interview. There is so much energy and depth in Marji's work. And I must echo her sentiments about the tribe of PPF. It's quite magical and affirming. I love Marji's work! This interview was fantastic! !Authentic and heartfelt! I am particularly amazed how much Marji learned from observation. A compelling story! I truly think a father would be honored at a daughter continuing on as his legacy! Love Marji's art. She is one of my favorite artists. Congratulations to her!!! wonderful interview and such wonderfully unique and gorgeous art Marji! Just what I need: More art supplies. 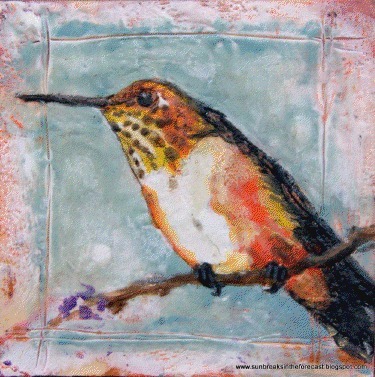 I have not tried encaustic, but you make it sound so great that I might just have to invest in a new obsession. Thanks, Marji. Was fun reading about how you came to do what you do Marji..Love your work. Everyone has a fascinating story. I love the girl with the goggles on! So awesome. I so enjoyed reading your interview.... your art is amazing. Especially love the first one! Fantastic art, Marjorie! What a great story, too. Thanks for sharing your art with the world again. Truly inspiring.